An impartial collection of the great affairs of state, from the beginning of the Scotch rebellion in…MDCXXXIX. to the murther of…Charles I… is the major work of John Nalson (c.1638-1686), an English clergyman, historian and political pamphleteer. The first volume of the text was published in 1682, and the second in 1683. The work was undertaken under the special patronage of Charles II and this, alongside Nalson’s much advertised pro-monarchy attitudes, calls the claim of impartiality into question. 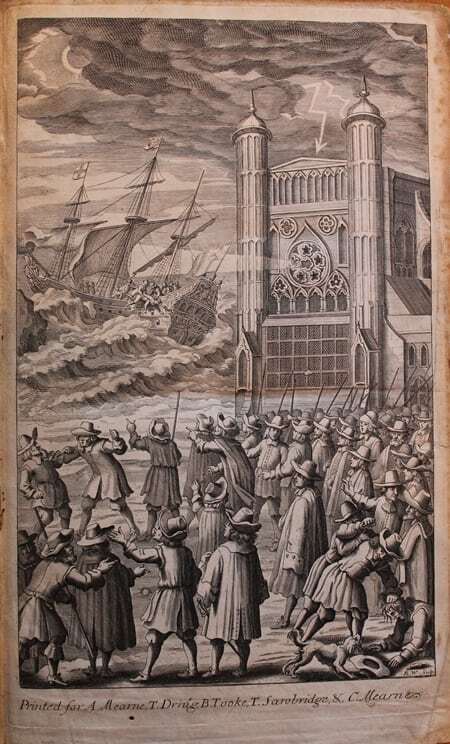 The volume of Nalson’s work that is held in the St George’s Chapel Chapter Library [SGC RBK N.5] has an illustrative frontispiece which shows a thunderous sky and a ship being tossed on a wild ocean. A man wearing a fur-lined robe and a crown is held over the side of the ship, presumably about to be thrown to the waves below. A crowd of people stands watching on the land. Most seem transfixed by the ship but some groups have turned away and begun to fight with one another. 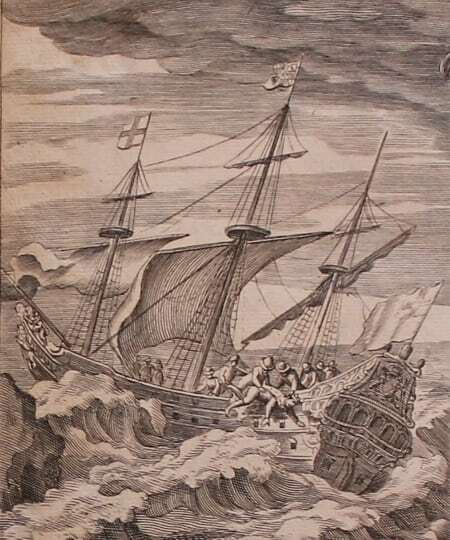 The plight of this ship is clearly supposed to provide a comparison to the experiences of King Charles I during the English Civil War, when the Parliamentarians clashed with the King and his Royalist supporters over the government of England. Ultimately this ended in victory for the Parliamentarians, who in 1649 executed Charles I (the act ‘impartially’ described in Nalson’s title as “murther”) and declared England to be a Commonwealth. The object of Nalson’s Impartial Collection was to serve as an antidote to the similar collection of materials that had been used by John Rushworth to write a history of the same period. Rushworth was a lawyer, historian and politician who had been personal secretary to the Lord Protector of the Commonwealth, Oliver Cromwell, and viewed Charles I as a king who had declared war on his own people. The restored king, Charles II, ordered that Nalson was to be allowed free access to various repositories of state papers in the writing of his account. From the documents in the Office of the Clerk of the Parliament he was apparently allowed to take almost anything he pleased. He also had access to take copies of documents in the Paper Office. He applied to the Duke of Ormonde, commander of the Cavalier forces in Ireland, for documents relating to the Civil War period in Ireland, and obtained permission to copy some of the papers. Lord Guilford communicated to him extracts from the memoirs of the Earl of Manchester, who had been an important Parliamentarian commander but fell into disagreement with Cromwell about the continuing war in 1644, retired from public life and later returned to actively assist the Restoration of the monarchy. Nalson also had plans to obtain help from the Earl of Macclesfield, one of the last survivors of the king’s generals.